Wolfcreek Cabin is secluded and oriented toward the romantic weekend. Grandma’s House is private and oriented toward the family. 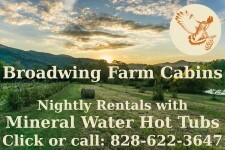 Both are within walking distance to trout streams and hiking trails. There is no extra charge for cleaning unless we find evidence of smoking, pet damage, or excessive general cleaning. Payment Policy: Credit cards or cash are accepted.